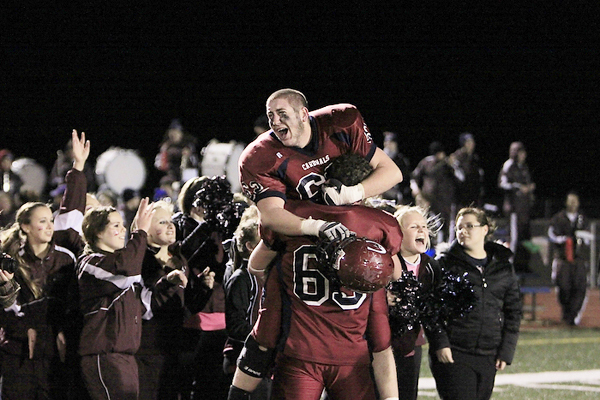 Gregg Webb knew what the feeling was like, celebrating a trip to the state championship game. His Eudora High School football players didn’t. The Cardinals are headed to the state title game for the first time in school history after holding on for a 13-10 win at home against Paola Friday night. Webb has been in the state championship game nine times when he was the head coach at Claflin – winning five titles – but that doesn’t make time No. 10 any less enjoyable. After losing momentum from a dominant first half, they led 7-0 at the break, the Cardinals found themselves down 10-7 with 10:57 remaining for what could have been the rest of their season thanks to a 74-yard touchdown run by Paola’s Tanner Staats and a 34-yard field goal by Luke Wilson. The Cardinals scored on the first drive of the game, marching 60 yards for a touchdown, but since that point the Panther defense had buckled down, allowing just four first downs and a fumble. “After they scored, we knew if we wanted to be the first Eudora team to go to state we needed to do something,” Pyle said. Eudora’s running game came back to life, as Pyle, Gabe Cleveland and quarterback Derek Webb – who converted a crucial fourth-and-1 – ran the ball on 10 of the drives 11 plays. Pyle wound up with the game-winner, breaking a tackle at the line of scrimmage and cruising in from 19 yards out for the 13-10 lead. All that was left was for the defense to get stops. Paola, who had thrown one pass on its first six drives, was suddenly forced to throw the ball and that gave Snell and his fellow linemen a chance to get pressure on Panther quarterback Seth Kern. The Cardinals would get two stops in the games final 5 minutes – forcing a punt and a turnover on downs to seal the win – helped strongly by three sacks on Paola’s final seven plays, with Snell getting one on third down on the final drive. “We knew they were going to pass. I just put the tackle off and went after him,” Snell said. Paola finished its season 11-2 with both losses coming to Eudora, who was also the only team to hold the Panthers under 27 points all season. The Cardinals will try and cap their impressive playoff run, which has included four wins by a combined 29 points, with a state title when they face Rose Hill Saturday at Salina Central High School Stadium. Rose Hill upset top-ranked Topeka Hayden 40-29.